If clothes really do make the man, you better make sure yours look sharp, because an ill-fitting suit looks a tad amateur and won’t inspire confidence at a high-powered interview. The good news is that it’s not just high-end bespoke retailers on Savile Row offering tailoring services any more. High street favourites offer alterations, sometimes free of charge, and you can even customise items from suits to jeans, so you’ll even look well put together for every occasion. A baggy, creased or slightly-shiny shirt can ruin a good suit. So what better way to get the perfect fit and finish by designing your own. The Savile Row Company offers an online made-to-measure service that allows customers to create the perfect shirt for £75. By following an easy-to-use guide (complete with a series of short videos), customers can create a unique shirt from scratch that will be tailored to specific body measurements. They can pick their own style of collar, cuffs, pocket, buttons, placket, and more. There are more than 60 different fabrics and patterns to choose from, as well as free monogramming – for the shirt pocket, cuffs or hem – and free delivery to anywhere in the world. Read more about it at Saville Row Co. If you’re a creature of habit and your wardrobe revolves around a good pair of jeans or chinos, you could get them altered to be the perfect length by shopping at Uniqlo. The Japanese basics chain stocks trousers in an array of classic styles and washes, but more importantly, it also offers alterations on all bottoms priced at £19.90 or more. And if you score a bargain making them cheaper than this, alterations cost just £3 per pair. 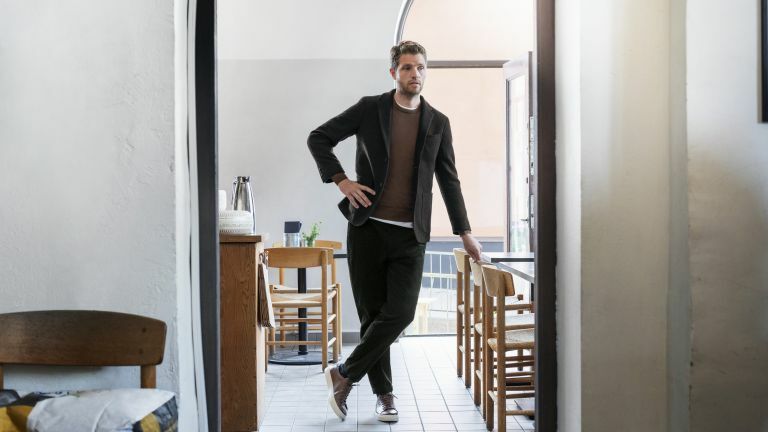 So whether you want to avoid that horrible sensation of damp jeans that drag in puddles or unsightly bunching of chinos round the ankles (not a good look), it’s a great service to know about. Reiss is known for its sleek tailoring and the swanky high street name offers a 17-step Personal Tailoring Service. Customers first pick the style of suit, which includes a choice of four styles of jacket, from Tuxedo to double-breasted, as well as the fabric they are after. They can tweak the types of pockets, lapel, cuffs and vents, add a waistcoat if they wish, and then choose from 20 lining choices that offer different colour and piping options. Shoppers can even tinker with final touches such as the type of buttons. Prices for a two-piece suit range from £645 to £1,345 depending on the suit fabric choice, but shoppers will have to wait for 6-8 weeks to get their hands on their bespoke suit. OK, Marks and Spencer may not be the most exciting place to shop, but it’s a high street staple for a reason. The shop offers a wide selection of suits in different cuts and colours (Ok we admit, not all of them stylish) but some, including those designed by the model, David Gandy, are on trend. The store offers a tailoring service that’s available at certain stores and is free when you purchase a suit work over £249. All you have to do is take the suit and receipt to one of those chosen stores and voila- you’ll get all the alterations you need. Because it’s M&S you can trust the suits will be durable too, which is great if you need them for work. And for men who hate shopping, you could throw in some non-iron shirts, shoes, boxers, socks and even dinner while you’re at it. Levi’s is known for its cool in-store customisation stations that allow you to add names and patches to jeans and jackets. You can also customise loads of stuff, including t-shirts, to your heart's content online. But for the ultimate personalised experience, there's Levi's Master Tailor service, which offers shoppers the chance to make a one-of-a-kind pair of jeans, from the weight and wash of the denim to the choice of rivets. You’ll get a private consultation, get measured so the jeans will fit perfectly and then make difficult detail decisions (zip vs button fly, for example). After this, the jeans are whipped up by a Master Tailor, taking 16 hours to make. Of course it’s not just men who need a smart suit when power dressing is required in the boardroom. Cherida is described as a new prêt-à-porter corporate wear line for women offering tieless styles. It offers an add-on service at point of sale where chosen garments can be tailored to fit the shopper’s exact measurements. Because the brand is catering for busy business women, a member of the atelier team will go to a customer’s house to take their measurements and understand their needs, or they can take measurements via the phone. Then the garments will be made to fit them perfectly. The brand has a core collection of 10 pieces, including dresses and jackets. Sometimes you need alterations right there and then, and then there are times when it might be more convenient to wait. Slater Menswear offers free alterations on all its suits, jackets and trousers bought instore or online – and the best bit is that the service is available a year after purchase. If a suit is bought in-store, a member of staff takes measurements before the suit is sent off to be altered and arrives back just one week later. The store sells own brand and branded clothes to suit men of all sizes and budgets. There are also a wide range of styles and colours to suit every taste. If hats are your thing, Yorkshire-based Kempadoo Millar makes bespoke flat caps beloved of Idris Elba and other stars. While the company boasts traditional craftsmanship and uses tweed and herringbone material, it is not afraid to experiment with a kaleidoscope of colours or elaborately patterned lining for an individual look that doesn’t look as if it belongs in Last of the Summer Wine. Customers can request individual designs, including flat caps and baker boy hats, in sizes to fit their head precisely. The company even makes headwear for winter weddings and flat caps start from around £60.